Nursery - Multiple changes in guidelines has delayed admission by over 2 months. 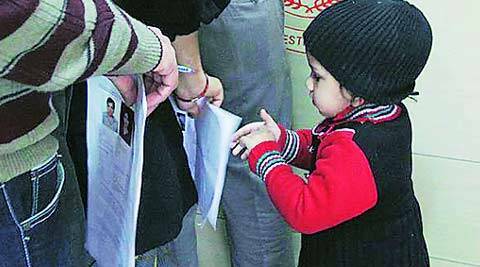 The government on Friday announced yet another nursery admission schedule in the hope of resolving the current admission fiasco, but the chaos is far from over. The order states that admissions, already delayed by over two months, will now commence on April 25. It has left schools and parents baffled with the “never ending admission cycle”. “This is like an endless nightmare. A new development comes to the fore every other week, and we get to look at a new set of dates or rules. Clearly, the issue is not getting resolved and it is causing inordinate delay. We have decided to wait for a final decision before starting the admission procedure again,” principal of Bal Bharati School L V Sehgal said. The admission procedure has been quite turbulent with four groups of parents already approaching the court over various aspects of the guidelines issued on December 18 last year. As a result, the guidelines have been constantly undergoing changes. “On Thursday, the High Court ordered fresh draw of lots for all applicants with 70 points, including those who had managed to secure seats. Now this group is also contemplating going to the court. The court had directed schools to reserve seats for the disabled, and that case is scheduled for March 12. As far as we are concerned, the litigation is far from over. There’s only one word that comes to my mind and it is ‘chaos’,” S K Bhattacharya, president of Action Committee for Unaided Private Schools, said. The schools, which will now conduct fresh draw of lots, are required to display the first list of selected candidates by April 7, the second list by April 15 and subsequent lists, if any, between April 16 and 21. The process will commence by April 25. “This is really unfair. We had got a seat, by sheer luck, but now I will have to let that go. All I have been doing is attending draws and visiting schools for verification,” Pratibha Ojha, who stays in Mayur Vihar, said. “If the government had bothered to hold consultations with all stakeholders, none of this would have happened. Schools that had taken a fee from parents now have to refund it. We are sceptical of conducting draws. Who knows when the next circular will come out and what changes it might bring?” Ameeta Mulla Wattal, principal of Springdales, Pusa Road, said. “Conducting draws over and over again is not easy. Besides, if the process will commence by April 25, when will the classes begin? Usually, we close our nursery wing by May 5. We are looking at a loss of an entire session,” Jyoti Arora, principal of Mount Abu School, Rohini, said. “Parents who have paid the fee are now asking for refunds. Even after three months, we are where we started,” Sumit Vohra, founder of admissions nursery.com, said. “This year has been unprecedented in the history of Nursery admission. Aggrieved parents have nowhere to go but the court. The court should do something to put an end to this back and forth litigation,” R C Jain, president of Delhi State Public Schools Management Association, said. A group of parents filed a plea on Friday, seeking the removal of points allotted under the sibling and alumni categories. The petition, filed through Sudhanshu Jain, claimed that alumni and sibling quota were creating inequality and was against the policy of neighbourhood. A group of parents had earlier challenged the points system, to which the court had directed them to approach the Directorate of Education (DoE) and file a representation. The plea filed on Friday said the DoE had not taken any action on the plea. The parents also said they had sent a letter to the Lt-Governor with statistics from prominent schools, which indicated that all the seats vacated after the scrapping of the transfer quota had been filled by children falling into the sibling and alumni categories. According to the nursery admission guidelines issued in December 2013, of a total of 100 points, 70 were given to those who live in the neighbourhood of the school, 20 if a sibling is studying in the same school, five for an alumni parent and another five in case of an interstate transfer. The government on February 28, scrapped the five points given to interstate category. The court of Justice Manmohan issued a notice to the Delhi government to respond to the matter by July 25.